Wow! I love it! No more l*ttle b*tts! This looks great – fab colour. And is truly a most excellent cape. It’s always nice to use a shawl as a cape. I just found you through LicketyKnit and I will definitely be returning b/c I can tell there’s tons more to see. I just don’t have enough time right now. Awww. So pretty! It shames me that it has been so long since I knit. this looks so great! i love how airy yours is between the motifs. great modeled shots and i never would have notice the BLT bulge if you hadn’t mentioned it. btw: if added you to my You Make My Day award list on my Feb 3/08 blog post. sorry to be so slow in letting you know. pass it on if you wish but please don’t feel obligated. Ha, you don’t look great with child– you just look great. That is an awesome shawl. Congratulations on the impending arrival of your BLT! This shawl looks gorgeous. The funky motif and cool colors and fiber more than overcome the more old-fashioned triangle shape. And when worn with a little black dress — you’re all set. Love it! oh i love it! you make shawls look cool, that’s for sure. 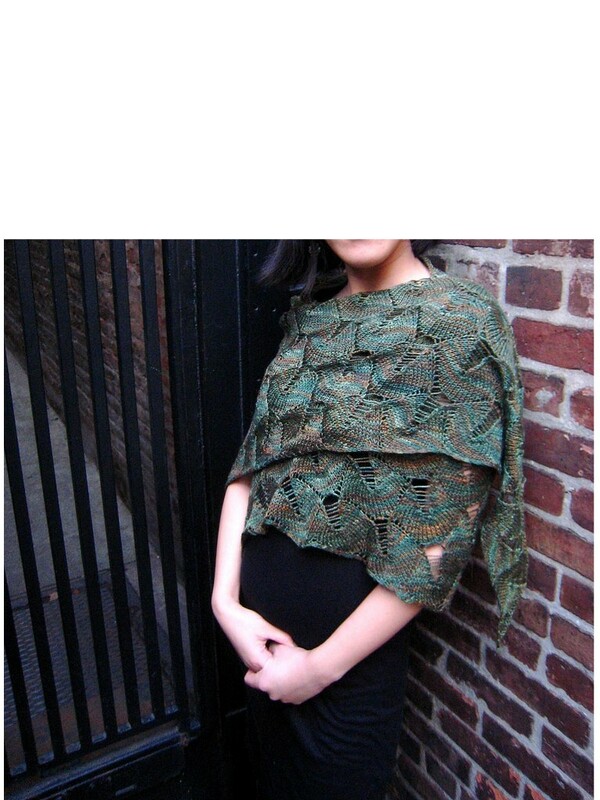 The pattern on the shawl is really cool, and I like the darker greens in the yarn that you ended up using. It’s fantastic! That absolutely rocks and your yarn choice is PERFECT. I can’t believe I never noticed that pattern before. May 27th, 2008 at 8:52 pm #New York Minknit » The shawl, it continues to grow.